If the mosaic is a mixed-media mosaic with rounded and irregular sculptural elements, a frame in the style of a generic photo frame or document frame may look out of place with its uniformity and minimalism and linear perfection. I think reclaimed wood with some naturally worn edges and grooves works very well, especially if you use the surface of the wood without sanding off all the wear and join the wood in such a way that matches the worn character of the wood. Reclaimed wood is a great example of downcycling in art and using repurposed materials. Wood bleached white from the sun might not be as useful as indoor wood that was been aged to a warm color. I salvage solid wood desks and chest-o-drawers when I see them on the side of the road, but here I’m talking about larger pieces salvaged from a house, maybe something roughly 1.5 to 2 inches thick, maybe something from an oaken door frame. Original nails can be good, preferably square, preferably flush with the surface or near to flush. Rust stains, knots, old peg holes, notches, channels and dovetailing are good features to look for when choosing your wood. I wouldn’t cut the wood to make a 45-degree mitre joint like a manufactured frame. The joint should not be a super-straight line with crisp corners if that isn’t how the other edges of the wood are. How I attach the pieces together at the corner joints depends on the sizes, shapes and end details of the wood I found. I like to notch things like the logs at the corners of the log cabin. In a cabin, the logs are notched shallow enough so that a log sits slightly above the two logs it is sitting on. For a mosaic frame, I cut deep notches so the four sides are all a the same level in the same plain and not two sides higher than the other two. No Daniel Boone, you don’t use an axe to notch something this small. Instead, use a wood chisel and mallet. You can cut a notch by making repeated passes on a tablesaw set to shallow depth, but I don’t like how uniform and crisp the tablesaw is compared to the wood chisel. You can peg the notch-joint corners with a rusty square-cut nail or brass wood screw from the front or a more generic fastener hidden from the back based on preference. A shallow pan of a dilute bleach solution can accelerate rusting of steel nails and other findings. The edges of any cuts need to look like the rest the wood. Round the edges of cuts by light controlled blows with a hammer and burnishing with an old rag that gives off traces of shoe polish or wood stain, not sanding. Better yet, look for pieces of wood that are slightly longer than needed and extend out to the sides. If a piece of old wood is too wide, consider splitting it instead of saw-milling it in a tablesaw. The frame should be built around the mosaic. What I mean by that is every time you join a corner, fit it onto the mosaic to test the fit before and after driving the fastener. I would probably have the surface of the frame be about 1/2 inch to 3/4″ inch above the surface of the mosaic but do it in a way that didn’t cause a problem shading or obscuring details. That is best accomplished by using wood that is thinner or more worn down on its inside edge. Make sure that your mosaic is securely integrated with the frame and can’t just pop out. For esthetic and structural reasons, the frame needs to be part of the art. Use adhesives and fasteners for safety’s sake. Use your wood chisel to make sure the mosaic fits snugly inside the frame. Smaller mosaic plaques can be hung using stainless steel multi-strand picture wire provided the weight isn’t too great and the mosaic is being hung where it cannot be brushed by someone walking past and isn’t hung overhead. 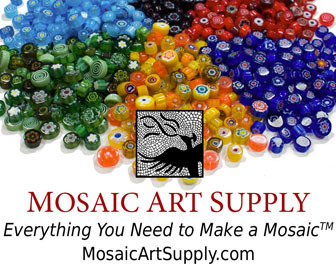 A mosaic is significantly heavier than a painting or photograph. Use double mounting wires. Use stainless steel multi-strand picture wire. Attach the first wire to nails in the back of the wood, not silly little screw eyes such as sold for hanging pictures. Wrap the wire under the heads of two nails on each side, first one nail, then the other down below it. That is your back up nail on each side. The second wire is the backup wire, and it runs to the same 4 nails and is wrapped under the nail heads over the top of the ends of the first wire. The nail should be selected for having a broad head, but don’t use a roofing tack. The heads of roofing tacks tend to break off easier than most nails. A screw with drilled pilot hole is preferable to a nail. You must not use wood that is too brittle or worn out to be structurally sound. The fastener will pull out or split the wood over time. Use good carpentry skills and stagger the fasteners so that they don’t split the same grain. The mounting wires need to hang on a fastener of structural size in the studs of the wall. If your mosaic is large and heavy enough, it needs to mounted with metal brackets similar to those used to mount mirrors, not hanging on a picture wire. Mosaic murals of this size may not need a frame. A carpenter friend who renovates old homes throws a lot of amazing art material into dumpsters all the time: oak flooring, oak door frames, old floor joists and ceiling beams. I’ve always been grateful that I’m tall enough to peak over inside a construction dumpster. This entry was posted in Joe's Rantings, Material and Tool Information and tagged hanging, presentation on October 16, 2013 by Joe Moorman.